I’m not much for nightlife but I had to stay up for the Valentine poetry contest. I was in San Juan, on the beach, and almost always I had been in bed by 9pm so I could start each day early. But tonight was the local bar’s poetry contest. I took a slow meander to look at the main street in the night hours and got my favorite cone, the one with coconut ice cream. By 10:30pm, I thought it must have started but when I walked in the bar, there was not a sign of anything except for the poster on the wall saying there would be a poetry contest tonight. I asked the waiter and he said it would start soon. So I ordered a drink and studied the people and wondered which ones were going to be contestants. Some poems were funny, some were sad, some rambled and some could have been labeled as terse. Valentine themes bring out all sorts of responses. A winner was awarded before midnight. I was pleased to have come but was on my way once the awards were presented. Walking on the boardwalk next to the beach, I noticed a man with his wares on a blanket. By the light of the moon, I saw that he had wooden sculptures. When he saw I was interested, he showed me how they could change position by turning on their pedestals. 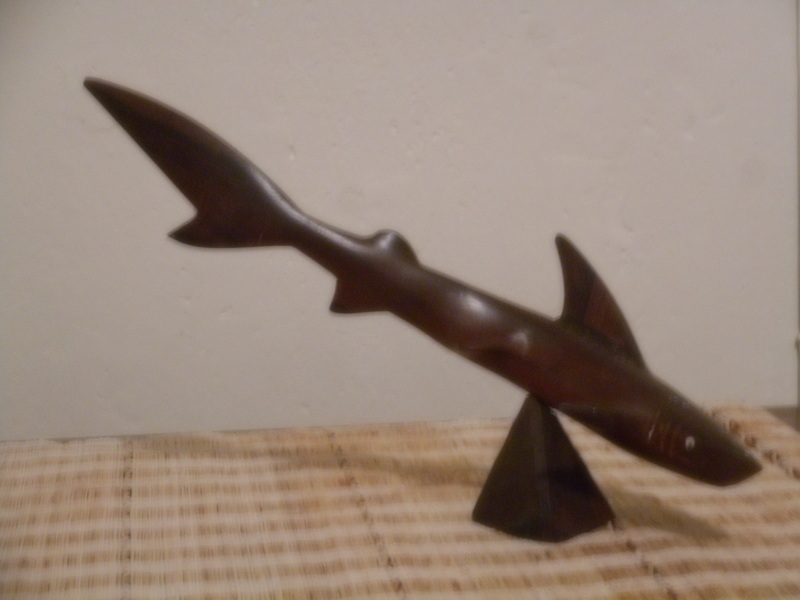 I purchased a sand shark. Now, I’ll never forget that evening.